If you do not feel comfortable and if you have to deal with the rucksack uninterruptedly, it very quickly gets on the nerves. Especially at larger backpacks and longer bike tours, you should place emphasis on good shoulder straps and a hip belt. Klick buckles and/or adjustable buckles take care of the perfect adjustment. This is the only good way to avoid pressure and chafe marks, in particular on the shoulders. If you are into fast and hard riding and love endurance sports, you should benefit from a hydration system. This signifies a biker backpack with an integrated hydration bladder. The advantage is quite obvious or let's say on the back. Hydration backpacks mostly have a separate compartment which houses the hydration reservoir. The bladders usually take between 1 to 3 litres depending on their volume. A drinking tube with mouth piece is put over the shoulder and connects you with your water reservoir. You do not have to get off the bike, you don't even have to stop in order to drink something. The most known manufacturer of these hydration systems is Camelbak. Here, in our shop you will find backpack sets, i.e. backpack including hydration bladder, as well as regular bike backpacks, which could as well be designed for taking up hydration bladders, but the choice of hydration bladder you want is left up to you. Thus, you can buy the hydration system yourself as an accessory. Bike backpacks also regularly undergo the critical attention of large bicycle magazines. These test results can be an enormous help when choosing a backpack. Experiences made by biker buddies or evaluations from the internet also help. In our online shop, you will find a large selection of biker backpacks, there is something there for every backpack user type. 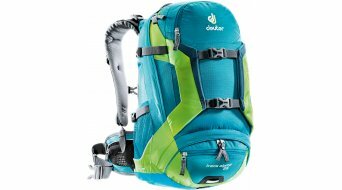 Well-known brands, such as Deuter, Vaude and Camelbak, the cooler version by Evoc or practical day packs from Brooks or Ortlieb. Here, in the shop specialized in biker backpacks, you will certainly find the companion best suited for you. You can order online at favourable prices, we conveniently deliver right to your door! In our category backpack accessories you will find all spare parts, such as replacement tube, mouth piece, or helmet holders for your backpack. Tip: A very important accessory, which never should be missing, is a rain cover. Should such a rain cover not be included in the scope of delivery of your backpack, the Euros are certainly well spent in order to keep your luggage dry during a rainy tour! Mostly, you will get those in bright, flashy colours in order for everyone to see you in time at horrible weather conditions. Note: Courier bags and other transport bags as well as protective covers can be found under bags and suitcases.